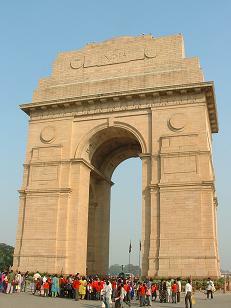 At the center of New Delhi stands the 42 meter high India Gate. 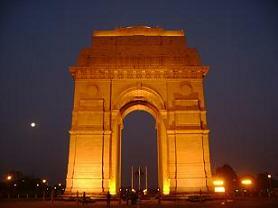 India Gate is a majestic arch which stands like archway in the middle of a crossroad. This place was built as a memorial of the 70,000 Indian soldiers who lost their lives fighting for the British Army during the First World War. This memorial bears the names of more than 13,516 British and Indian soldiers killed in the Northwestern Frontier in the Afghan war of 1919. The foundation stone was laid by His Royal Highness, the Duke of Connaught in 1921 and was designed by Edwin Lutyens. Beneath the India Gate burns an eternal flame .The monument was dedicated to the nation 10 years later by the then Viceroy, Lord Irwin. Another memorial, Amar Jawan Jyoti was added much later, after India got its independence. It is in the form of a flame that burns day and night under the arch to remind the nation of soldiers who laid down their lives in the Indo-Pakistan War of December 1971.The entire monument is extremely beautiful and the arch stands on a low base of red Bharatpur stone which rises in stages to a huge molding. beneath, which are inscribed Imperial sons. Above on both sides is inscribed INDIA, flanked by MCM and to the right, XIX. From the base of the arch one can get a good view of Rashtrapati Bhavan. Surrounding the imposing structure is a large expanse of lush green lawns, which is a popular picnic spot. Connaught Place is an important shopping centre of New Delhi. This place was designed to connect Old and New Delhi. This place was built in a horseshoe pattern, consisting of inner, middle and outer circles. It came up in 1931 with the official transfer of the capital from Calcutta to Delhi. Now, it is the most wanted place of the next generation and various multi-storey buildings are also located in its periphery. Connaught Place and its outer ring, Connaught Circus, together comprises two storeyed arcaded buildings. Connaught Place was designed by Sir Robert Tor Russell. This is the main commercial centre of Delhi. Architecturally, both the Connaught Place and the Connaught Circus are very distinctive. To the South is the Jan Path (the People's Way), on the East and West are the hostels for the members of the newly convened Legislative Assembly.